Are you looking to buy a performance turbo outlet? Each Megan Racing Turbo Outlet helps to improve the exhaust flow right where you need it the most in your turbo-charged vehicle–right after the turbo. Turbo outlets are also known as an o2 housing. The turbo outlet improves the exhaust flow between the turbo and the down-pipe. This is most often a bottle-neck in turbo-applications. Secondly valuable horsepower can be gained by upgrading to our turbo outlets which allow your turbo to flow exhaust gasses more efficiently. Finally this is an upgrade that has a great bang for your buck. Turbo outlets start at just $120. In conclusion if you have already completed your downpipe back exhaust components the turbo outlet is the last piece of the puzzle. In other words you are going to enjoy the new found power. 100% T-304 Stainless Steel Piping mandrel bent to maximize exhaust flow mated to computerized CNC-machined flanges with TIG-welds for strength and long-lasting durability. 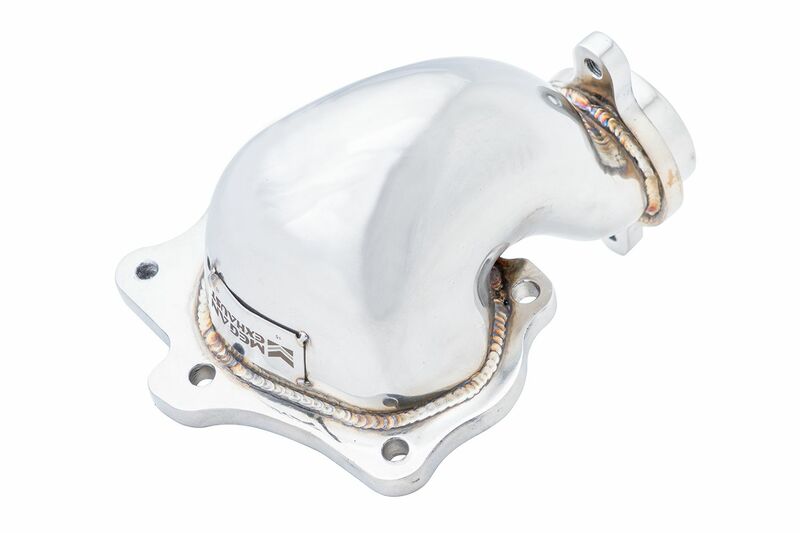 Designed for use on OEM Turbochargers.